On Tuesday I wrote about what happens when you do not follow a cookie recipe. 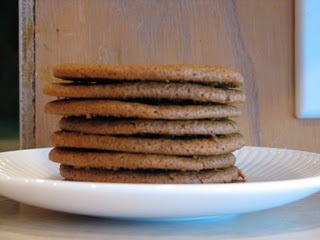 Well, here is a picture of the molasses cookies when they are done according to directions. These are a thin but chewy cookie. I think the longer you refrigerate them the better they will turn out. So I would recommend at least 4-6 hours in the refrigerator or overnight. These are one of the best tasting molasses cookies I have made. I will be making these again. Put butter, brown sugar, and 1/2 cup sugar in a bowl. Mix together until smooth about 3 minutes. Mix in eggs one at a time. Then add molasses and oil. Gradually add flour, baking soda, cinnamon, ginger, allspice, and salt. Cover and refrigerate several hours or overnight. Preheat oven to 325 degrees. Roll about 1 tablespoon of dough into a ball. Roll into sugar to coat. Place about 3 inches apart on a cookie sheet. Bake for about 15 minutes or until centers are set.